Staying healthy is critical to having a great travel experience - whether that's for business or pleasure. Inevitably though you are going to have situations where something goes wrong. This makes it essential to prepare ahead of time and educate yourself. While getting sick is no fun, stuff can and will happen - even for the most prepared person. With proper planning though, you can reduce both the severity of the situation as well any associated recovery time. For instance, last year in Amsterdam Heather got a cold and - just finding a simple over the counter medicine proved to be a huge challenge because of the brand name. That does't mean you shouldn't travel .. just be smart and as prepared to protect your health as you are for other aspects of your journey! One of the most important advances for those of us who travel regularly is mobile technology and video streaming. We all know that Samsung does a great job on hardware innovation. However they are also doubling down on software as well, especially with their Samsung Health app. Samsung Health tracks your activity, nutrition and sleep, and delivers insights based on your progress. You can also set your health goals, track your activity, get insights based on your lifestyle, stay motivated, and keep your health information secure. One really cool addition is the "Ask An Expert" feature that was enabled through a partnership with American Well that allows them to integrate hardware, software, and people together to offer a great service that is perfect for people who travel. 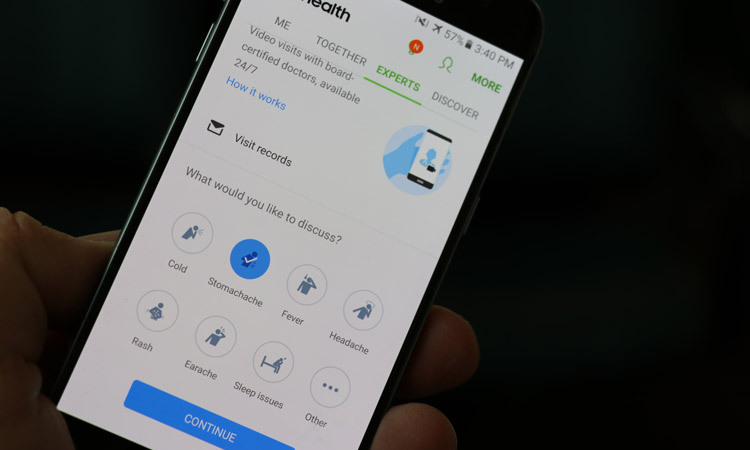 Because of this partnership, the Ask and Expert feature of Samsung Health (found on nearly all newer Samsung phones) is already pre-installed and there's no having to download anything extra. As someone who travels constantly, I know that it's just a matter of time before you draw the short straw and get sick on a trip. While this service not a replacement for life threatening ailments requiring an ER or urgent care clinic - it's a great solution to help get some expert advice. Services that the doctors here can help with include most common ailments that you are going to face while traveling including upset stomach, sore throat, sleep problems etc. One of the things I like about it is that these are actually board certified doctors and it let's you pick them based on their Amwell ratings and biographies. This means that you aren't just stuck with a new doctor right out of school - but rather one that has years of experience as a real life doctor. You can also chose a DO vs an MD like you would with your normal family physician. They can even provide prescriptions and send them automatically to a local pharmacy of your choice. There are other telemedicine services, but what I like about this one is that everything is already there in your phone if you have a Samsung device such as Galaxy S7 / S8 / Note etc. Additionally, since your phone can measure Pulse, Sp02, and Blood Pressure the doctor on the other end of the phone as much more data available than simply a video screen where you describe your symptoms. 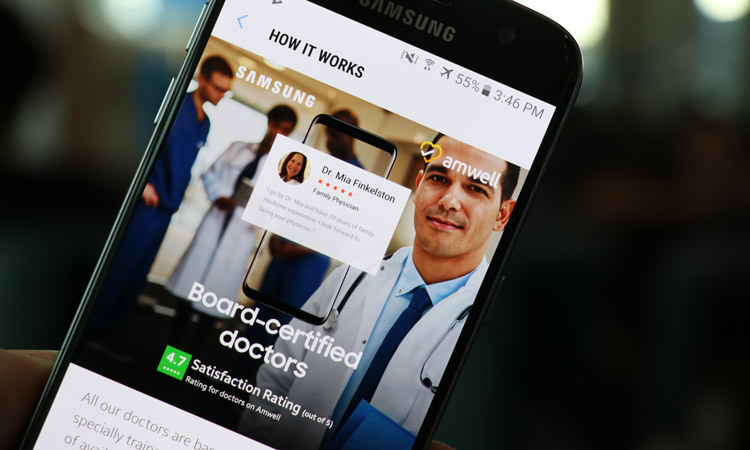 With the integration between hardware, software, and service it makes it easy to share the information you've already been collecting through the Samsung Health app with the physician. For instance, in addition to data collected from the phone itself, Samsung Health tracks your biometric data and syncs with many partner apps such as MyFitnessPal, Garmin, and MapMyRun to gather more information about your health. This makes your consultation much more effective since it's more than you just saying, "ouch, my tummy hurts". The medical consultation service is only available for use in the United States right now (except Arkansas). This is a great tool to help with a variety of ailments ranging from colds to rashes as well as other common travel maladies including sprained ankles, headaches, or stomach issues. Price for a visit is normally $59 but with the promo code SAMSUNG9, you can get $10 off. All you need to do is log into the Samsung Health app, select an available doctor and begin your consultation. It's that easy. You can also earn Samsung reward points for enrolling (while supplies last), subject to certain terms and conditions. Before traveling anywhere, it is essential that you know what your coverage is "out of network". While most health insurance policies will cover you while traveling, each one will differ on what the procedure for reimbursement is. This can add up quickly if you go to the wrong provider or don't get proper authorization should that be needed! What's even better is that many insurance policies actually cover telelemedicine services like the one found in the Samsung Health app. If not, services like this are typically able to be used with funds from your HSA. If you have perscription medicines then there is always a chance that you might lose them while traveling. One easy backup solution is to take photos of the lable with your phone and make sure they are backed up in the cloud somewhere (or just email them to your emergency contact). This way, should they need to be refilled, you know the doctor, pharmacy, dosage, and other details. This will save significant time and stress since you can typically visit another pharmacy and get at least a few pills while waiting for your doctor to send them a new script. This is not an issue in the United States, but when traveling over seas it can be a huge help. For instance if you have a cold and need to break up mucus and clear conjestion - you might just go to CVS and get Musinex - but what if you are in another country? Since you've written down the genaric medicine name, you can simply ask for guaifenesin-DM instead. While the genaric medicine might not be EXACTLY what you are looking for, it will help. I'm always shocked by the number of guys that use the restroom and then simply walk out without washing their hands. Don't be that guy! Honestly though, while traveling you should wash your hands every chance you get - before and after meals, before and after getting on the plane and as soon as you get to your room. This helps reduce the chances of you spreading other people's germs but also lessens the chances of spreading your own. Many people with life threatening ailments already have medical bracelets, but it is a good idea to have specific details written down in your phone or on a piece of paper in your wallet or travel bag where someone can find it if needed. This goes beyond simple "first responder" type situations, but would be a huge help if you have a specific back issue for instance, or any allergies that would require special consideration. For instance, I know that Heather has certain medical issues but I don't know all the details. By writing it down somewhere that I can access should she not be able to describe them properly it can help reduce the stress of the situation and make things easier for us as well as the medical practitioner. In theory, your hotel room should be clean when you get there but it's always a good idea to bring a bottle of anti-bacterial handwash and cleaning wipes with you as well. This is especially important for your rental car, public transportation (including planes), as well as after opening doors. You don't need to bring a huge kit, but having some sanitizing wipes to wash down the remote in your room or your suitcase handles can help you avoid illness. This should go without saying, but if you try to eat more healthy and get plenty of rest that is good for your body. A healthy body is going to resist illness better, as well as be able to recover faster.